Reviving Newark's Woodland Cemetery ~ The History Girl! Neglected. Abandoned. Forgotten. For over eighty thousand "residents" of Newark, New Jersey's Woodland Cemetery, time has taken its toll on their final resting place. Once a glorious and inviting garden cemetery, Woodland has been heavily vandalized over the past forty years and past boards of directors have done little to prevent and rectify the actions of disrespectful individuals. This year, a renewed interest by family members of those interred have sparked a small, yet hopeful step forward in the revitalization of this thirty-six acre property. The task is daunting, but enthusiasm in reviving this Victorian treasure is gaining momentum. Cemeteries like this across the United States are in need of a new lease on life and volunteers have stepped up to the challenge. We honor and respect those who came before us, and for every stone that is righted, new opportunities for interpretation and education abound. In 1854, the New Jersey Legislature granted an act of incorporation to the West Newark Cemetery Company. By August of 1855, the company had selected about fifty acres of land in which to establish the cemetery. The land, which had been largely woodland consisting of chestnut, oak, cedar, and elm, may have served another purpose prior to becoming a cemetery. According to A History of the City of Newark, New Jersey: Embracing practically two and a half centuries 1666-1913, the author references "the old Shooting Park, which had to give way to the city of the dead (Woodland Cemetery)." Although no maps have been found to date which validate the author's claim, there is evidence of another shooting park (shooting gallery) established in the 1860s by the Krueger family of Newark, off of South Orange Avenue. Despite the cemetery being established in 1855, development of the grounds did not occur until a few years had passed. History of Essex and Hudson Counties, New Jersey, Volume 1, published in 1884, claimed that "a number of years elapsed before extensive improvements were made." Woodland Cemetery is a rural cemetery, meaning that its layout was unlike earlier church graveyards. Rural cemeteries were often built on the outskirts of a town, surrounded by a stone wall, and featured natural rolling hills, curved pathways, landscaping, and trees. 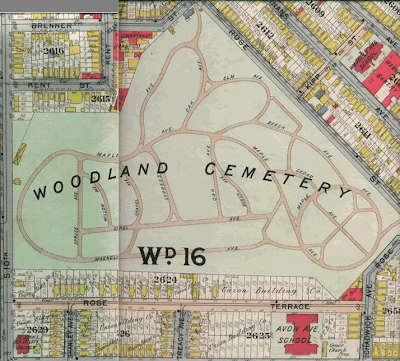 Woodland Cemetery was no exception, as later maps show curved paths and landscaping. Additionally, between 1870 and 1880, a two-story Gothic Revival brownstone gatehouse was built at the cemetery entrance. The gatehouse featured a three-story wood frame bell tower and curved brownstone arch over its entrance gates. Remnants of blue-stone sidewalks and curbing can be found near the gatehouse. 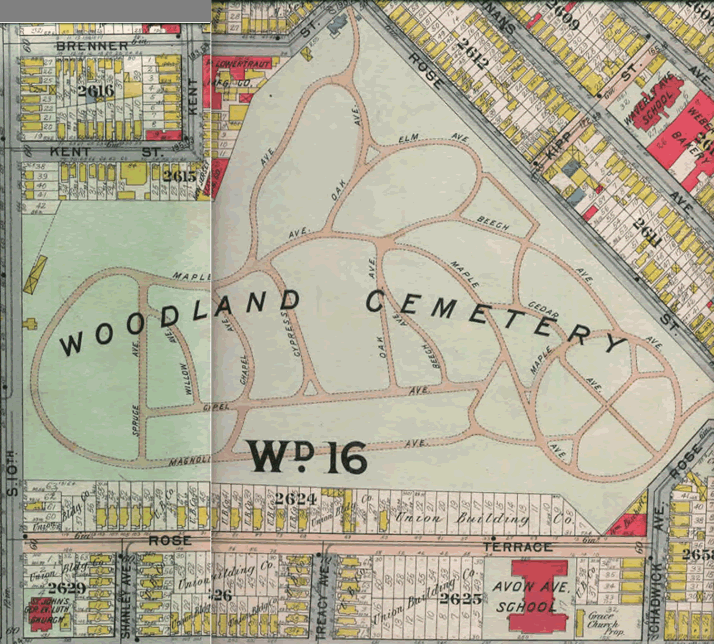 A map of Woodland Cemetery, circa 1890s. A majority of the cemetery's earliest burials were of German descent. Many of the earliest grave markers bear German inscriptions, giving a clue as to the ethnic makeup of the local neighborhood. During the site's formative years, it was nicknamed the "German Cemetery." An early grave marker bearing German inscriptions. Over five hundred war veterans are buried in Woodland, from the War of 1812 through the Vietnam War, including over three hundred fifty veterans of the Civil War. Peter P. O'Fake (1820-1884). the first Black American to conduct the Newark Theater Orchestra in 1848. Since the 1960s, due to a number of socio-economic and political factors, the cemetery has not been well-maintained and fell victim to severe bouts of vandalism. Thousands of headstones have been toppled, sections of fencing stolen, the grounds used as a dump and haven for the homeless. In the 1980s, the caretaker vacated from the gatehouse and the building was abandoned. Since then, the main staircase and floors have caved in, the roof has failed in multiple areas, and a tree has grow up through the building from the basement. First floor of the Woodland Cemetery gatehouse in Newark, New Jersey. Vandalism is a constant problem at cemeteries across the United States. However, there are numerous ways to curb vandalism and damage to cemeteries. If you are a member of a group caring for a cemetery, develop a relationship with your local law enforcement agency and ask them to put your cemetery on its patrol routes. Even though no one lives at the cemetery, there are often neighbors adjacent to the property. If so, ask them to watch for suspicious activity in the area and to report to the police immediately. Remember, vandals are often attracted to a property that appears neglected. If the grounds are maintained, your chances of vandalism decrease. Fences and lighting also deter criminal activity. However, a high, solid fence will act as an invitation to vandals and should be avoided. ◆ Map all features that have been damaged. Using a cemetery map, mark the stones, tombs, markers, fences, walls, paths, and vegetation that have been damaged. If no map is available, a hand-drawn sketch identifying the location of each feature will serve this purpose. ◆ Record the present condition of each affected feature. Sketch the location of the affected stone and describe the damage. Be precise! Take photographs in addition to the written record. A good record will include information about the location, the damage, the materials, the condition, and the size of the site and its components. It will also note previous repairs, record inscriptions, identify motifs and design elements of the various features, and indicate where fragments are stored. Damaged headstones at Woodland Cemetery, Newark, NJ. ◆ Use care. Historic markers are fragile. If there are broken markers, do not step on the fragments. If trees and limbs have fallen on markers, carefully cut limbs away in small sections, carrying them away as you work. Do not let the limbs fall on the stones beneath them. ◆ Photograph the broken markers both before and after the removal of trees and limbs. ◆ Carefully remove pieces of the broken stones, only after double-checking your documentation. Once you have moved a stone, it will be impossible to remember which direction it faced, its precise location, or the details of its construction. ◆ Do not discard fragments. Fragments that seem insignificant can be vital to later restoration efforts. fragment; where it came from, when it was damaged, why it was removed, and the inscription, if possible. Never write on the fragments themselves! The new volunteer Board of Managers at Woodland Cemetery and the associated Friends Group have been assessing the damage to the property and are slowly beginning to clean up the site. Reaching out to the local schools, it has enabled children and young adults the opportunity to spend time performing community service while learning about cemetery care and maintenance. In addition, these students learn about those buried at the cemetery and may even recognize famous local names! By partnering with the community, it allows them to become stakeholders in the cemetery property and demonstrates to vandals that the property is cared for and that their damage will not be tolerated. Woodland Cemetery is still a long way from becoming the beautiful park that it once was, but thanks to volunteers and interested members of the community, the grounds will be receiving the attention they deserve and the effects of over forty years of neglect will disappear. I'd like to volunteer to help with the clean up process. Where can I go? E-mail dsilva@woodlandcemeterynnj.org for more information.